All Weeks: Liver Support: Liver Stabil, Liv-52, or Essentiale Forte (label recommended dosage). Cholesterol Support: Lipid Stabil (3 caps/day) and Fish Oil (4 g/day). Estrogen Support: tamoxifen (10-20 mg/day). Comments: This is a very common first cycle for building muscle mass, and utilizes a single standard bottle ofmethandrostenolone.This cycle is likely toproduce very noticeable muscle growth in a first-timesteroid user,often in excess of 8-10lbs of weight gain. This is usually not accompanied by significantvisible side effects such as gynecomastia and water retention. 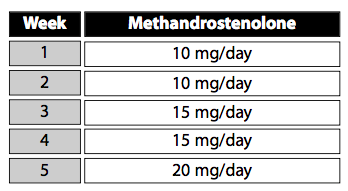 Although this is considered a beginner’scycle, methandrostenolone is a c-17 alpha alkylated oral steroid, and presents significant cardiovascularand liver toxicity. The repeated use of such drugs should be limited. Cholesterol Support: Lipid Stabil (3 caps/day) and Fish Oil (4g/day). Estrogen Support: tamoxifen (20-40 mg/day). Comments: This is a common follow up to the first Dianabol cycle, utilizing a slightly higher dose and longer duration of intake. The dosages used here are more common for bodybuilding purposes. A slightly greater intensity of adverse reactions is likely. All Weeks: Cholesterol Support: Lipid Stabil (3 caps/day) and Fish Oil (4 g/day). Estrogen Support: tamoxifen (20-40 mg/day) or anastrozole (.5 mg/day). Comments: This mass building cycle is likely to yield similar quantitative results as an early Dianabol cycle, but is favored over the oral for its lower cardiovascular and hepatic strain. The doses used are expected to cause mild shifts in the HDL/LDL cholesterol ratio, but not the substantial changes normally seen with oral anabolic steroids. This sample cycle is likely to present the least amount of health side effects of all listed in this section. All Weeks: Cholesterol Support: Lipid Stabil (3 caps/day) and Fish Oil (4g/day). Estrogen Support: tamoxifen (20-40 mg/day) or anastrozole (.5-1mg/day). Comments: This cycle is a common follow up to the first testosterone only cycle, with a higher dosage and 3 week longer duration of intake. 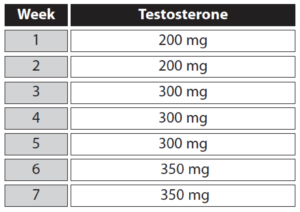 The total testosterone dosage given is double in comparison, and is likely to produce more pronounced estrogenic and androgenic side effects. Cardiovascular strain may be slightly higher than the first cycle, but should remain substantially lower than cycles with oral AAS. 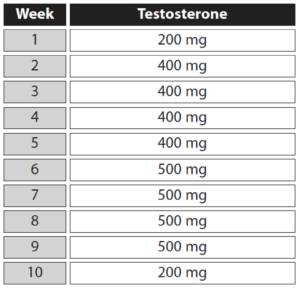 Testosterone is arguably the safest, and at the same time one of the most effective, muscle-building steroids available. The exclusive repeated use of a cycle like this would be advised over more adventurous cycling/stacking if possible. Estrogen Support: tamoxifen (20-40 mg/day) or anastrozole (.5-1 mg/day). Comments: This mass building program is similar to the other testosterone cycles, but utilizes Sustanon 250, a form of blended testosterone more widely used in Europe and other regions outside the U.S. 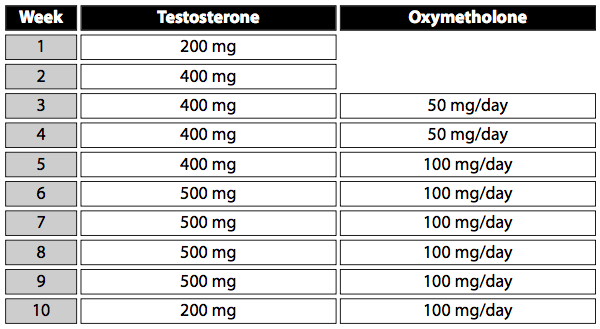 The total steroid dosage of this cycle is 3,750 mg, extremely close to the amount used in testosterone cycle #2. A similar level of cardiovascular strain and visible side effects are expected. Comments: Oxymetholone is commonly regarded as the most potent mass building steroid available. It is also prone to causing both strong estrogenic and androgenic side effects. A steroid novice may gain 15-20 pounds or more on this cycle, although a significant amount of this will be water retention, which will subside soon after drug discontinuance. Oxymetholone is also known for inducing strong cardiovascular and hepatic stress. While this drug may be more convenient to use than an injectable testosterone, it is not regarded as a safe alternative. Repeated use of c-17 alpha alkylated orals like this should be limited. Comments: This is a more popular version of the oxymetholone only cycle. The doses here are more common with experienced steroid users, and more than sufficient to promote strong mass and strength increases. Side effects may be more noticeable than the lower dose cycle, of course, which may necessitate a higher dose of tamoxifen. Comments: This is a common first-cycle for an athlete looking for performance improvements or a bodybuilder looking for a lean mass or cutting steroid. 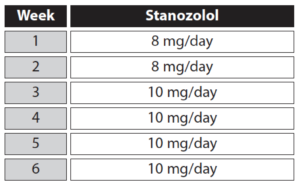 This cycle was more common when stanozolol was widely available in 2 mg tablets. Such preparations are now uncommon except in Europe. The dosage used here is low by bodybuilding standards, although similar cycles have been the backbone programs for many athletic competitors, especially during the 1970s and 80’s. Significant visible adverse reactions are unlikely at this dosage. Comments: This is a stronger version of a cutting/lean mass building cycle utilizing stanozolol. 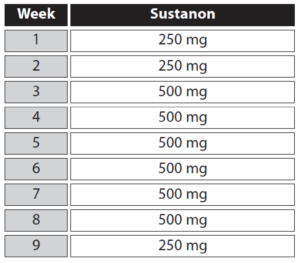 The dosage used here is substantially higher than the first stanozolol cycle, a fact that makes this cycle more properly suited for bodybuilding purposes than Stanozolol Cycle #1. Cardiovascular and hepatic strain will be more notable,and visible side effects more pronounced, than the first cycle. There should be no need to addition an estrogen maintenance drug. Comments: This is an extremely old and widely repeated steroid combination, based on the predominantly anabolic steroid nandrolone decanoate. 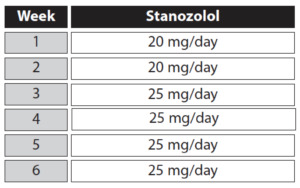 Methandrostenolone serves as the androgenic component of this stack, and is added during week 3, which is a time that side effects of reduced androgenicity (with the exclusive use of nandrolone decanoate) are commonly noticed, such as loss of libido and sexual dysfunction. The doses used in this cycle are not high by most bodybuilding standards, but are sufficienttoimpart a noticeable increase in muscle size and strength. Comments: Amore popular manifestation of the Deca/Dianabol Cycle, with more commonly accepted dosages for amoderately experienced steroid user. 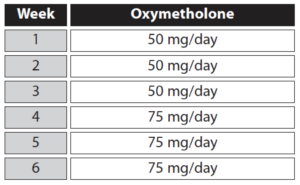 Incidences of side effects are expected to be higher at these dosages, although overall this stack is likely to be less problematic than a combination of testosterone and oxymetholone. Comments: Acombination of testosterone and oxymetholone is generally regarded as the most potent 2-drug stack for gaining raw muscle mass. Both drugs will present significant estrogenicity, and will be likely to induce gynecomastia quickly unless an estrogen maintenance drug such as tamoxifen is used.Inexperienced steroid users have been known to gain over 25-30 pounds on a cycle such as this. Water retention will be very high with this stack, however, and a rapid loss of water weight (possibly up to 10 pounds or more) is expected soon after the cycle is discontinued. Comments: Testosterone with nandrolone is considered to be one of the most fundamental 2-drug combination stacks. Nandrolone compliments the androgenic base of testosterone by supplementing additional anabolic activity without strong estrogenicity. The resulting stack is almost as productive as a cycle utilizing a higher dose of testosterone alone, but less problematic in terms of estrogenic side effects such as water retention, gynecomastia, and fat buildup. Estrogen conversion is still formidable enough to warrant the use of an estrogen maintenance drug, however, and this stack remains in the realm of mass building instead of lean mass or cutting. Comments: This is an effective but mild orals-only lean mass building cycle. 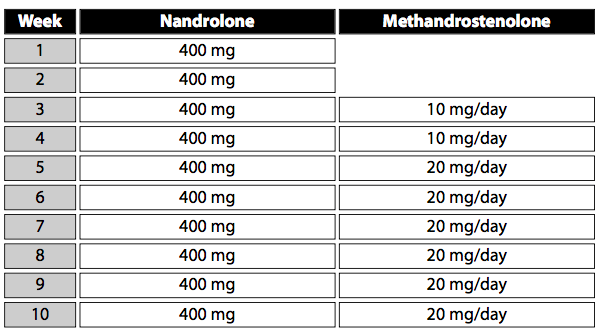 Andriol is used as the androgenic base, but in doses that do not greatly exceed normal therapeutic levels. Oxandrolone is non-aromatizable, so significantly elevated estrogenicity is unlikely. Tamoxifen 10-20 mg per day may be used should the testosterone dosage turn out to be problematic. This stack is popular among older men and those not wishing to use injections. The principle drawback with this stack is that it uses a c-17 alpha alkylated oral, and therefore has elevated cardiovascular and liver toxicity. This combination also tends to be very expensive, and is far less cost effective than many stacks based on an injectable testosterone. Comments: This is a 3-month non-liver-toxic cycle that has 2 distinct phases, mass and lean mass/cutting. The first 6 weeks of training and diet are focused on mass building. Significant estrogenicity will be present in these weeks, and may necessitate the use of tamoxifen or an aromatase inhibitor such as anastrozole to prevent gynecomastia and excessive water retention. Estrogen maintenance drugs may be reduced or possibly eliminated after the start of phase 2, which focuses on increasing the androgen to estrogen ratio and solidifying the muscle mass. A maintenance dosage of testosterone remains during this second phase, in a effort to prevent sexual dysfunction or loss of libido, which often occurs with the use of predominantly anabolic steroids alone. Estrogen Support: tamoxifen (20 mg/day) and anastrozole (.5-1mg/day). Comments: One of the more extreme mass building cycles in common use among bodybuilders. This stack will impart rapid gains in raw muscle size and strength. This drug combination is highly prone to causing estrogenic and androgenic side effects, including extremely significant levels of water retention. Gynecomastia may also be an issue very early into the cycle. The use of an aromatase inhibitor is likely to be necessary to cut down on the conversion of testosterone to estrogen. 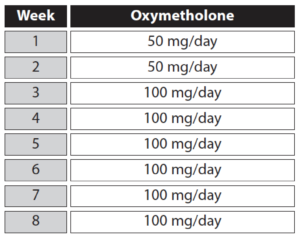 Oxymetholone is highly estrogenic but does not aromatize, however, which may necessitate the additional use of tamoxifen. Although often highly problematic with regard to side effects, and therefore rarely recommended to beginners, few steroid combinations can compare to testosterone, oxymetholone, and trenbolone for building rapid muscle mass. Comments: This is an effective stack for hardening, cutting, and gaining lean muscle mass. Neither agent is capable of converting to estrogen, so this cycle should significantly elevate the androgen to estrogen ratio. This may assist in the breakdown of fat tissue, enhancing muscle definition. This stack should not present significant liver toxicity, although cholesterol ratios may be significantly altered in light of reduced estrogenic activity. Comments: Stanozolol and trenbolone are popular steroids during cutting phases of training, and impart strong anabolic and moderate androgenic effects with no significant estrogenicity. This combination helps to impart a strong fat loss/definition-enhancing effect. 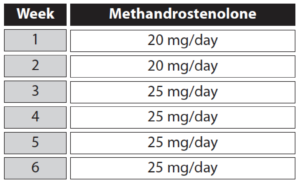 Two 25 mg tablets of mesterolone have been added per day to supplement additional androgenic activity, which should help maintain normal libido and sexual functioning. Additional anti-estrogenic drugs should not be necessary. Some more aggressive competitive bodybuilders may enhance this cycle by adding rHGH, clenbuterol, and/or thyroid hormones. Higher doses of the individual steroids may also be used, but are expected to impart stronger cardiovascular and hepatic strain, and are generally not advised.